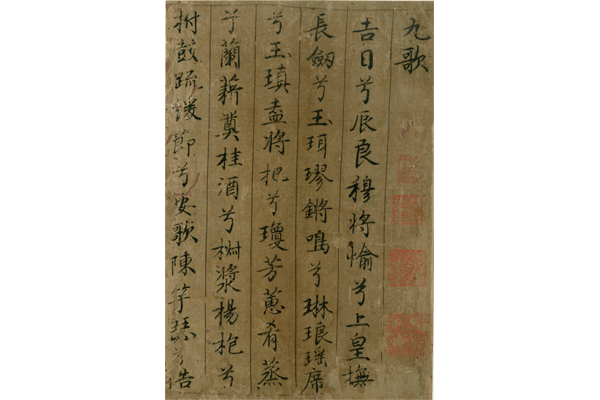 Xia Yian was regareded as a talented Prime Minister by Wang Shizhen in terms of his calligraphy skills that attract the collector's attention. Sadly, his calligraphy artwork was not largely passed to next generation as he unfortunately stepped down following a failure of political wresting with Yan Song. West Villa Poems in Running Script, Jinmotang Calligraphy Research Foundation's collection, were written by 1534 ,a bit later than Wen Zhenming's another poem of West Villa. Compared to both poems, we can assume that West Villa played a vital role not only as an royal garden, but also a place for worship where emperor Jiajing indulge himself in Taoism. The aim of this article is to analyse a famous handscroll Painting of Tang Ying, a current collection of Freer Gallery, should be attributed to another painter according to the long colophons. After a long debate between Prof. James Cahill and Mr. Jiang Zhaoshen in 1960s, it is a bit surprising, but interesting, to observe that this masterpiece is an example of how the name of author was cut off and the fake was created instead. In Tang Dynsaty, correspondence was not as important as Northern sung after Su Shi and Huang Tingjian. Even Auyang Xiu thought, reading and collecting the correspndence, could help people remember and respect the predecessor. During Ming dynasty, the number of collection and circulation of correspndence is increasing. 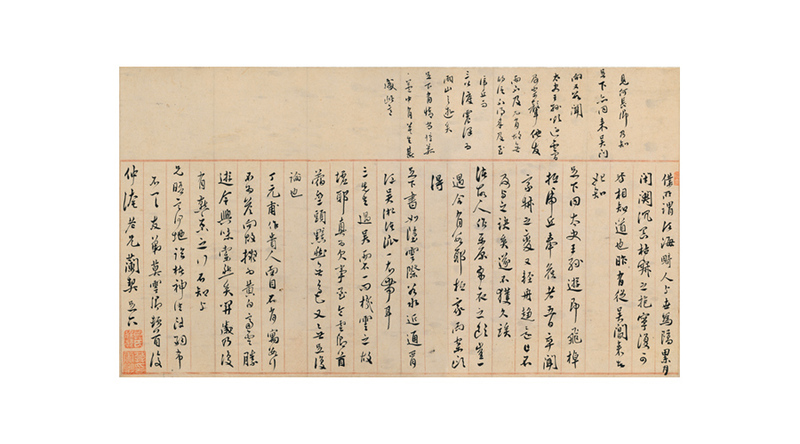 Correspondence in Jinmotang Calligraphy Research Foundation's collection mainly focus from Ming to Qing period. We are glad to introduce 6 copies of correspondence dated from Chenghua to Jiajing period from which we could imagine the social life and obligation among literati. Cai qi was not only an officer in Qing period, but also quite a famous collector when we found that there had been a close bond between Wang Hui and him in art aspect. However, very few details about the patronage from Cai qi were recorded until this painting was acquired and studied. According to this research, Cai qi had collected not less than 12 Wang Hui artwork on which his collector seals could be found. In this thesis, we would go over the letter and documents in order to find out the Artisit-Patron relationship between them. 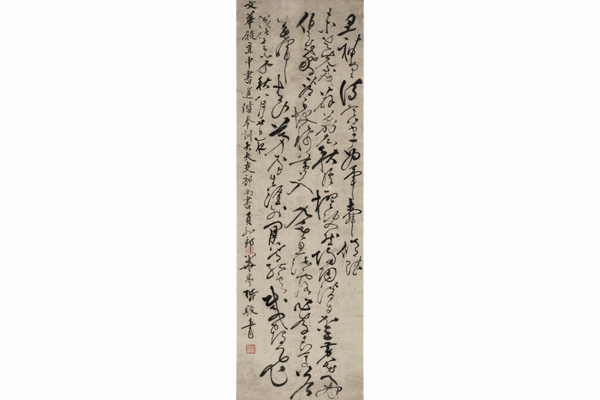 Jinmotang Calligraphy Research Foundation (JMT) acquired a handscroll containing five correspondences of Mo Shilong. 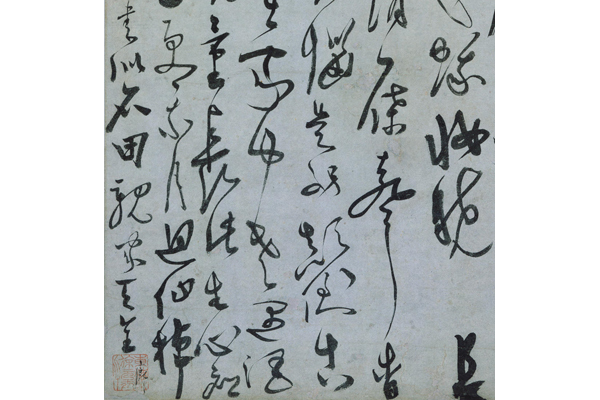 The second correspondence written to Wang Zhongyan, a notable officer and literati, related to the content of another undated correspondence in Qian Tangjing collection. The essay is to look up the history and identify the writing year. On the other hand, a correspondence to Zheng Zhixu (now in Taiwan Palace Museum's collection) and the first correspondence of JMT should have connection in terms of the writing year and the history of literary gathering. An album of Li Ti's inscription left us a message that Li Ti had aquired a calligraphy artwork in silk of Huang Tingjian and ordered the craftsman to make an imitation in the year of Muxu  although it was believed not as good quality as the original one after he wrote a Jiu Ge poems on it. Having studied the collector seals, we found that it was acquired formerly by a collector,namely Jiao Youlin in Daoguang period as well as a Taiwan collector, Lin Xiongguang, during the period of Japanese Occupation. Through this case study, the research attempts to examine the life of Li Ti and discuss his calligraphy style and status in terms of history of calligraphy. Baiyan Poems album, originally mount as a handscroll, was written in the year of the sixth year of Jiajing  including 8 poems literally refer to the theme of white goose. It was also mentioned that the album was to present to Tan Dongshi, a friend of Lu Shen. Through a case study of this album, this thesis is to analyse the political meaning in the poems. Also, the research attempts to examine how Lu Shen derived his calligraphy from learning Zhao Mengfu and Li Yong, and discuss his status in the history of Chinese calligraphy. This calligraphy piece, Xiaomaiwang studio, in seal script was wriiten by Zhao Zhiqian requested by Panzhuyin who was one of the most important officer in late Qing period. The name originally came from a collector studio, Maiwangguan, in Ming dynasty. 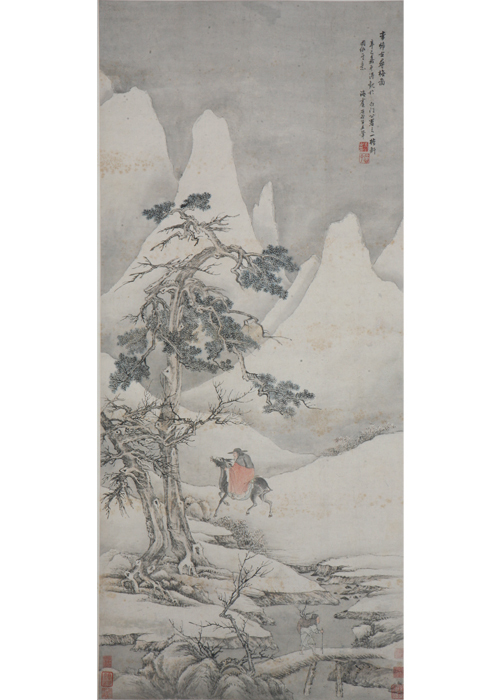 It is believed that the artwork was finished between the tenth and eleventh year of Tong Zhi [1871-1872]. Through this horizontal panel, the article attempts to examine the "artist-patron" relationship between Zhao Zhiqian and Pan Zhuyin. A Xu Youzhen calligraphy artwork in Jinmotang's collection present a very strong skills and personal style in cursive script. The inscription leaves us a message that Xu went for visit with his two compatriots, Zhu Hao and Liu Jue. Although he didn't mention the year of this travel, it is expected he finished the artwork after his retirement to Suzhou from the court. The seal in the bottom left corner, namely Donghai Xuyuanyufu, is consistent in style with the examples in Biehou Tie (Palace Museum) and Taohuashuwutu (National Museum), but not with the one mentioned in Zhongguo Shuhuajia Yinjian Kuanzhi which was edited by Shanghai Museum. The aim of this article is to re-consider the authenticity of Xu Youzhen's seals. 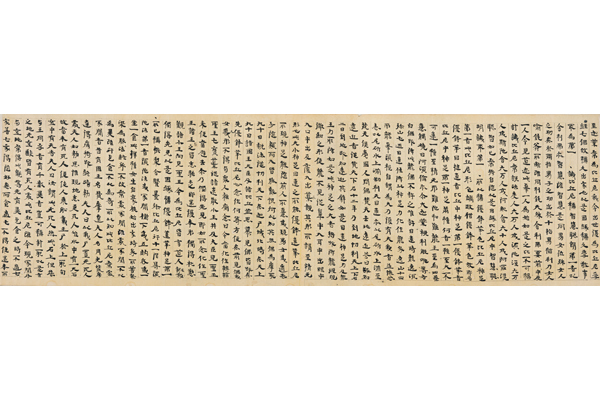 A three-folio manuscript of Dunhuang provenance (ms. 羽619) located in the Kyōushoku collection (杏雨書屋) was described by the editor of the Dunhuang Miji (敦煌秘笈) as a different version of the Zengyi ahan jing (增一阿含經, T 125), and possibly belonging to a so far unattested or lost Ekottarika-āgama sūtra. The research project presented in this thesis aimed at verifying this hypothesis. In the course of my preliminary survey, I was able to locate another manuscript (ms. 近墨堂1002.hs), which, in facsimile, appeared very similar to ms. 羽619. This research finds that ms. 羽619 and ms. 近墨堂1002.hs can be collated and are in fact a single manuscript. After the collation, it was possible to closely inspect the content of ms. 羽619+近墨堂1002.hs. This contains stories of six eminent disciples of the Buddha, among whom five are bhikṣuṇīs. At first glance, the text may appear to belong to the chapter on bhikṣuṇīs in the Zengyi ahan jing (增一阿含經). On closer inspection and comparative textual study, however, I came to the provisional conclusion that the text may be closer in genre to a commentary such as the Fenbie gongde lun 分別功德論 (T 1507), an unfinished Chinese commentary on the Ekottarika-āgama. The text in question, though, cannot be identified as stemming from the Fenbie gongde lun (分別功德論) itself nor from a different version of the same work. As regards the dating, Fang Guang-chang (方廣錩) (2013) assigns ms. 近墨堂1002.hs to the Eastern Jin period (東晉) (AD 317–420). Since the translation of the Zengyi ahan jing (增一阿含經) was completed in AD 385, a new commentary (i.e., 羽619+近墨堂1002) based on this very translation could only appear later. Provided that manuscript 羽619+近墨堂1002 appears to belong was a commentary on the received translation of the Zengyi ahan jing (增一阿含經), on the basis of close parallels in phraseology between 羽619+近墨堂1002.hs and the extant Zengyi ahan jing (增一阿含經), I would suggest a dating to the period AD 385 onwards. Song Ke, a native of Changzhou, was a foremost calligrapher as well as an accomplished poet during late Yuan and early Ming period. Having a good reputation among the literati in Suzhou and Songjiang region, he then bonded well with lots of famous people. Also, His excellent calligraphy techniques had, no doubt, a profound influence on the later calligraphers in the first century of Ming dynasty. A Song Ke calligraphy album, with 11 leaves in Jinmotang's collection, was signed "Guangping Song Ke" himself which also appeared in the inscription of a Zhao Mengfu album recorded in Shiqu Baoji. Compared the text of 2 artworks, we are able to confirm Guangping is his hometown and analyse the historical background and reasons of writing this text. This datable album is of vital importance to understand the skills and styles of his calligraphy in accordance with other museum collections, except one dated to Hungwu period in Tianjin museum. 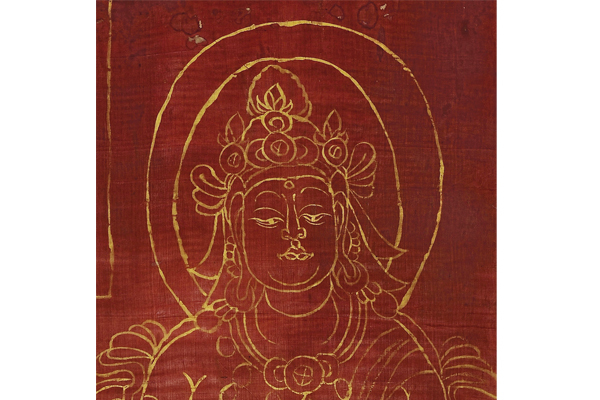 A Bodhisattva Banner of Dunhuang, datable to Tang or Five Dynasties, displayed in Beijing Guardian Auction in 2014, was acquired by Jinmotang Calligraphy Foundation. 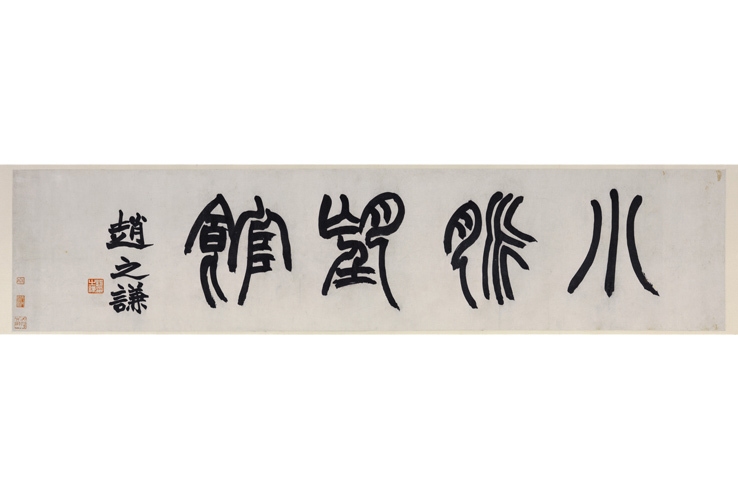 This banner was collected by Zhang Daqian earlier before and then passed to an old Japanese collector. The painter originally drew the lines on a rectangular red silk by yellow ochre pigments, leaving a blank rectangular space in top left corner without inscription of the Bodhisattva name. Comparing with the other similar banners in the museum collections, we try to analyse and understand the historical and art value of this artpiece. 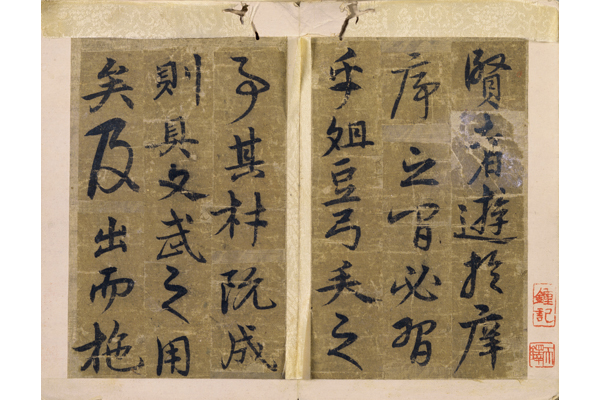 Among Wang Duo’s extant calligraphies, almost half were made to fulfill social obligations. Wang’s attitude towards writing that is meant to satisfy social obligations was complex. On the one hand, he was willing to write calligraphy for financial gain and to expand and maintain his social network; on the other, he was sometimes annoyed at the pressure to deliver work. To preserve the quality of his output, he would postpone deliveries or refuse commissions. On occasion, Wang Duo brushed calligraphy at social gatherings, where the presence of an audience created an atmosphere of keen anticipation and heightened his urge to perform. Wang possessed a keen sense of drama that made his energetic performances on these occasions memorable. Especially at gatherings like these, he made certain to include strong contrasts among the elements of his work to make a vivid visual impression on his expectant audience. The phrase “artworks of social obligation” is often understood to refer to careless work executed in haste. These works are contrasted to those done for self-amusement or as personal gifts, circumstances customarily taken to be optimum for the production of good quality work. The body of Wang Duo’s output, however, includes many brilliant pieces that were made to meet social obligations. This suggests that our presumption of a direct relationship between artworks of social obligation and the quality of such works should be reconsidered. Zhu Yunming was recognised as the grestest calligrapher in Ming Dynasty, but it is not uncommon to see the fake works and copies of his soon after his death. The number of fakes even raised until the late Ming period. As a result, it is hardly to have a fair criticism and judgement on him. We know little about his typical style before we identify most, if not all, of his calligraphic works. In this article, Graphology would be applied to re-analyse his works.